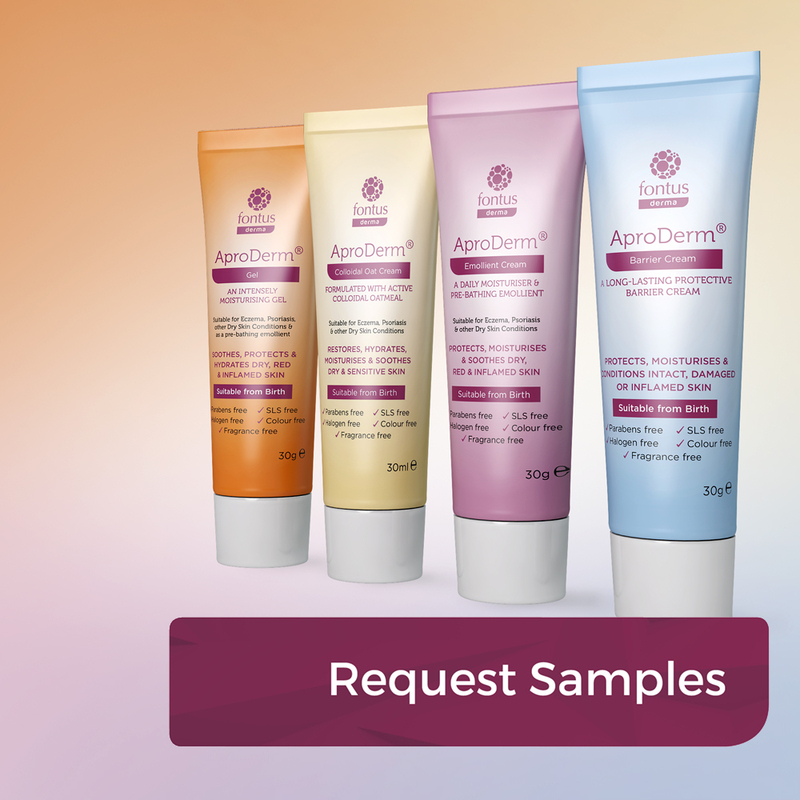 AproDerm® is a range of occlusive, leave-on emollients that are suitable from birth to soothe, moisturise and protect skin suffering from eczema, psoriasis and other dry skin conditions as well as being effective daily moisturisers. 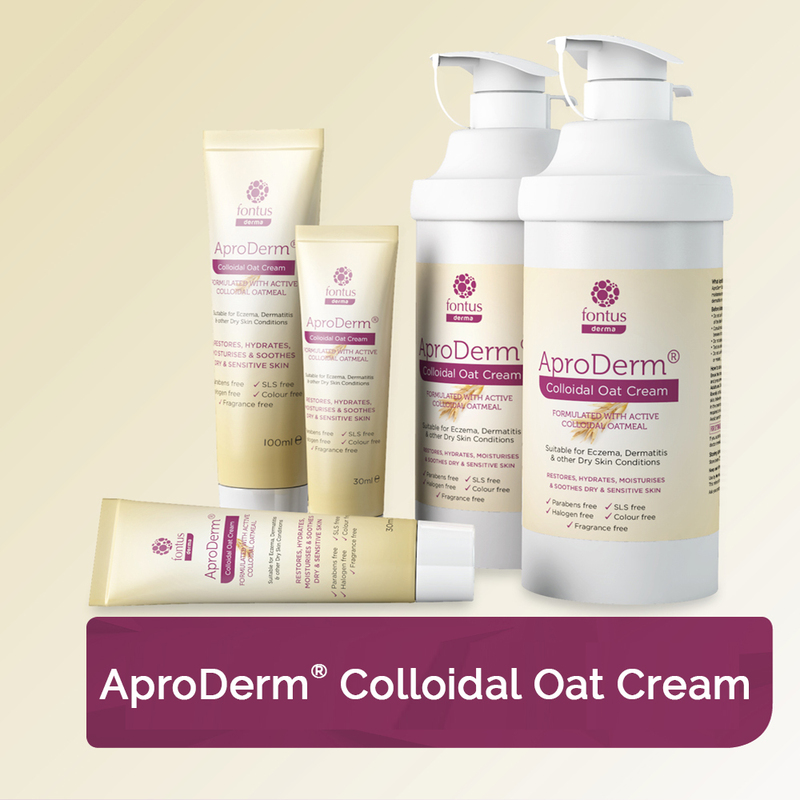 By forming an occlusive layer over the skin the AproDerm® range traps water within it so hydrating, softening and smoothing it. The evaporation of water from the cream formulations when applied to the skin causes a cooling effect which also soothes it. 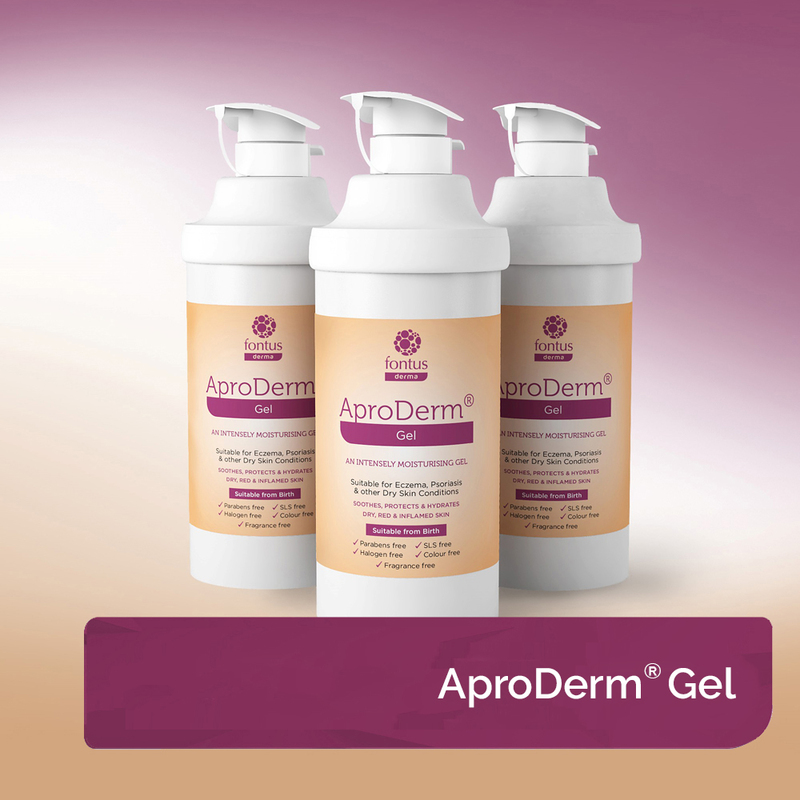 How Does the AproDerm® Range Work? Our skin is the largest organ of the body and is made up of three main layers: the epidermis, the dermis and the hypodermis or subcutis. The Epidermis, the outer skin layer, consists of five smaller layers: the stratum basale, the stratum spinosum, the stratum granulosum, the stratum lucidum and the uppermost layer the stratum corneum, which is the skin barrier. 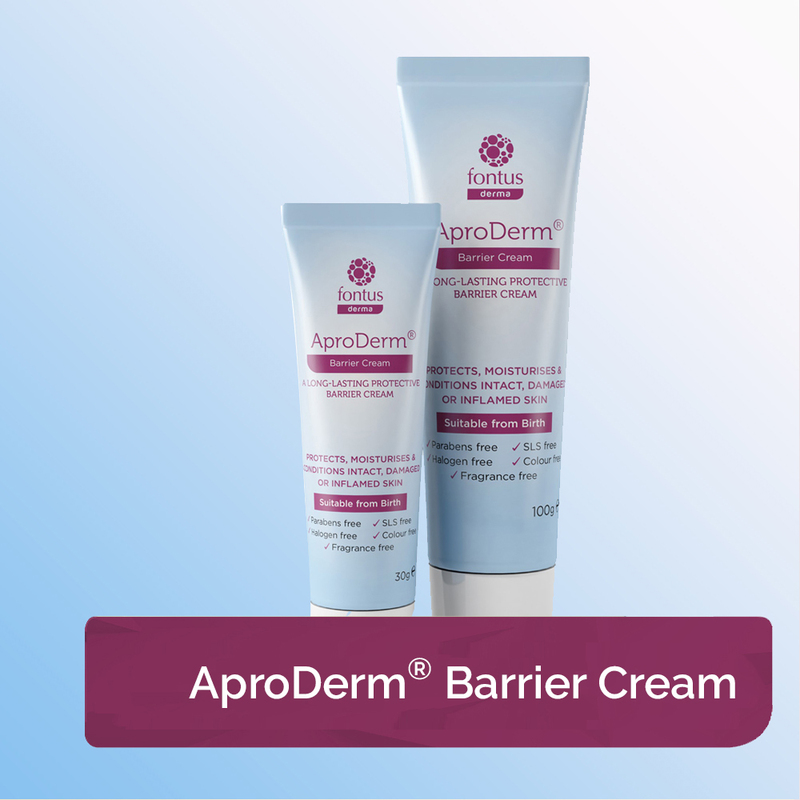 To understand how the AproDerm® range works, we first need to look at this barrier and its functions. The best way to think of this barrier is as a brick wall which, in healthy skin, keeps pathogens, irritants and allergens out whilst preventing the loss of water and other substances. 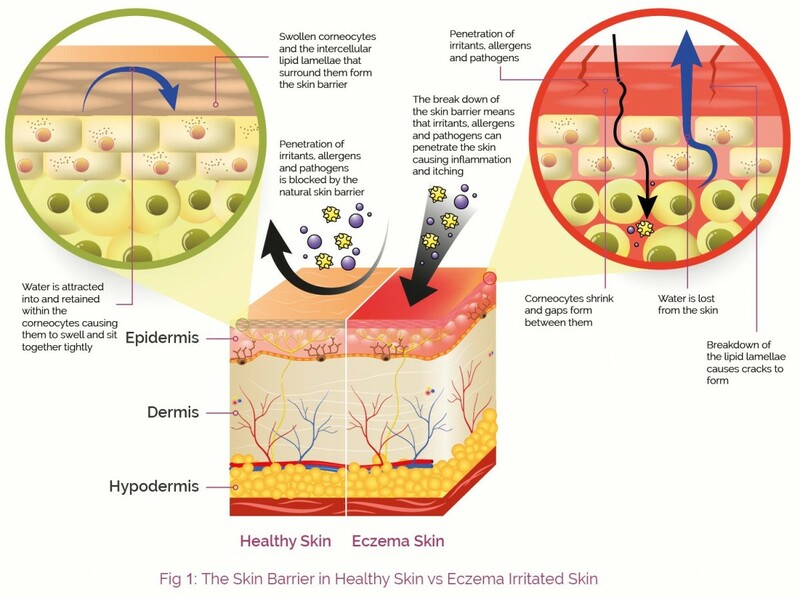 Within the barrier the individual bricks are the corneocytes (anucleated keratinocytes) which contain Natural Moisturising Factor (NMF), which acts as a humectant and attracts water into the cells. This results in the corneocytes becoming swollen and so causes them to sit tightly against each other. The intercellular lipid lamellae (composed of phospholipids, cholesterol and glucosylceramides) represents the mortar in this analogy and surround the corneocytes helping retain water inside them so producing a smooth and strong semi-permeable barrier as shown in Fig 1. There is some water loss through this semi-permeable barrier, this is normal, and is called Transepidermal Water Loss or TWL. 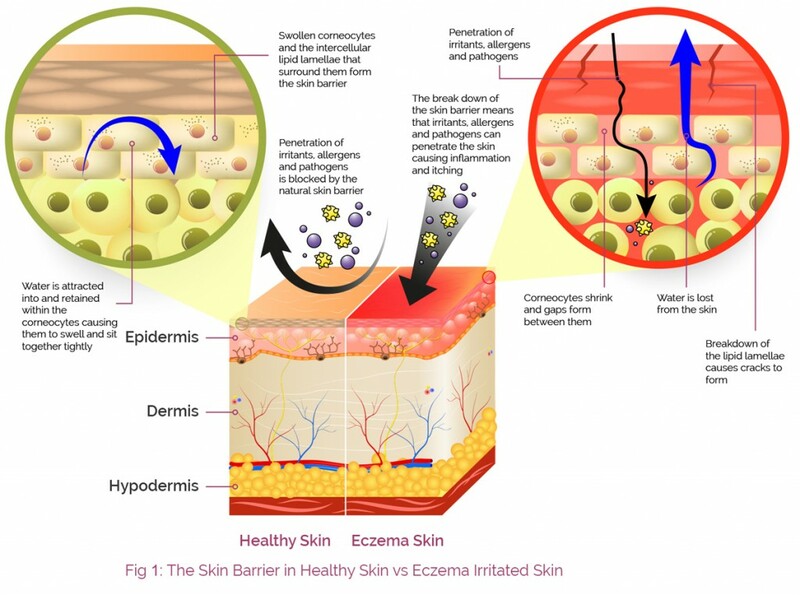 In dry skin conditions such as eczema the skin barrier is no longer effective as a result of the breakdown of the lipid lamellae and a reduction in the amount of NMF in the corneocytes. The net effect is a reduction of water within the corneocytes, these start to shrink resulting in gaps forming between them and, due to the breakdown of the lipid lamellae, cracks start to appear in the skin (the mortar is crumbling). We now have a barrier with cracks and gaps which allows irritants, allergens and pathogens in and more water, than the normal transepidermal water loss, to be lost (see the Eczema side of Fig 1). This causes dryness, inflammation and itching flaring up eczema, psoriasis and other dry skin conditions. Itching and inflammation can lead to scratching which in turn can lead to further irritation exacerbating the itch-scratch cycle and making the eczema, psoriasis or other dry skin condition worse. 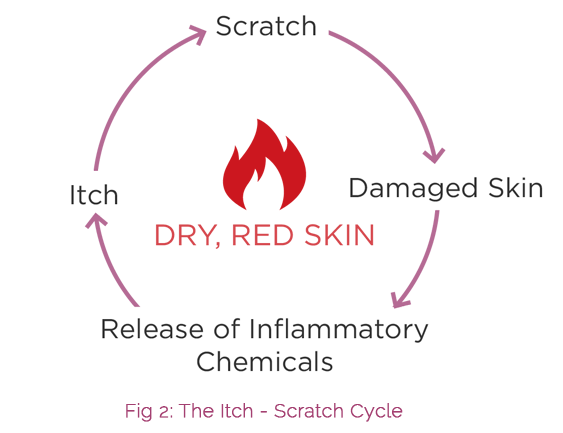 Scratching can also break the skin causing it to bleed, leaving it open to infections and can result in thickening of the skin. 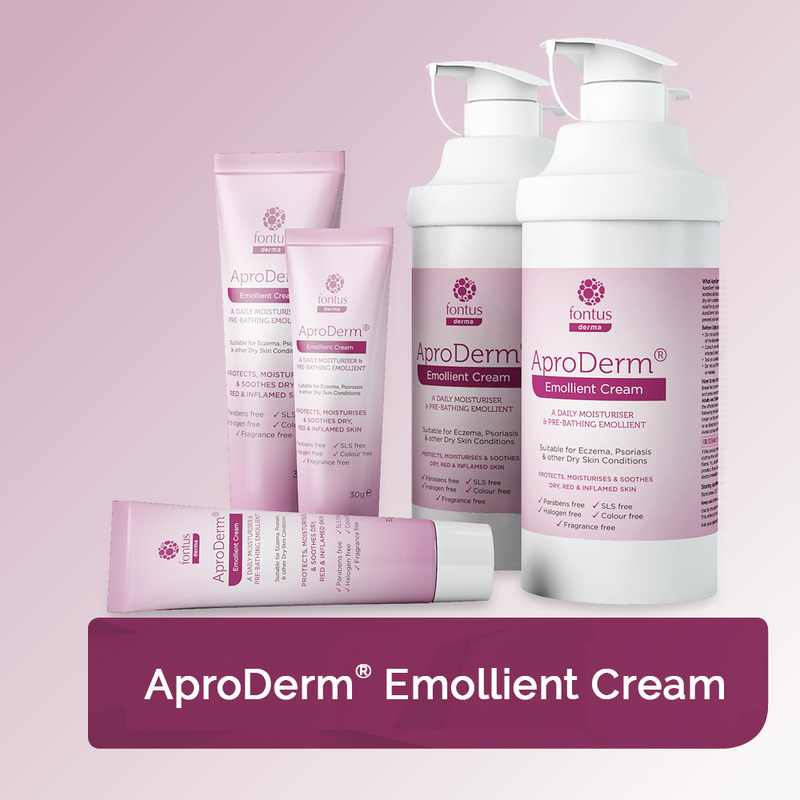 Emollients, such as the AproDerm® Range are moisturising treatments which are used to break the Itch – Scratch Cycle and to maintain the smoothness of the skin. They work by; helping skin retain water, moisturising the skin, easing itching, reducing scaling, softening cracks and protecting the skin. Emollients are therefore leading symptomatic treatments for eczema, psoriasis and other dry skin conditions where a patient’s skin has become reddened, dry, itchy and cracked. Forming a protective, occlusive layer over the skin’s surface trapping in water which then goes into the corneocytes, rehydrating them and causing them to swell again. 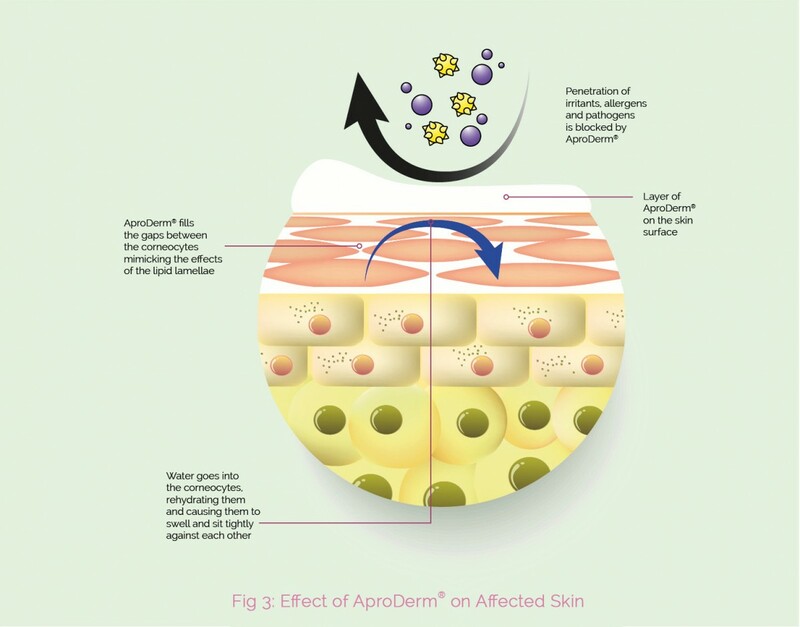 AproDerm® also penetrates through the upper layers of the stratum corneum filling the gaps between the corneocytes so that they are once again surrounded, mimicking the lipid lamellae and thus restoring the skin barrier so that irritants, pathogens and allergens are kept out whilst keeping water and other substances in, as illustrated in Fig 3. Rehydration of the skin helps relieve the itching, irritation and discomfort associated with eczema, psoriasis and other dry skin conditions. In psoriasis it also softens psoriatic patches, which makes them less likely to crack and cause the skin to become sore. They can also be used to remove the scales which in turn helps in the application of other topical psoriasis treatments and should be applied 30 minutes before them. 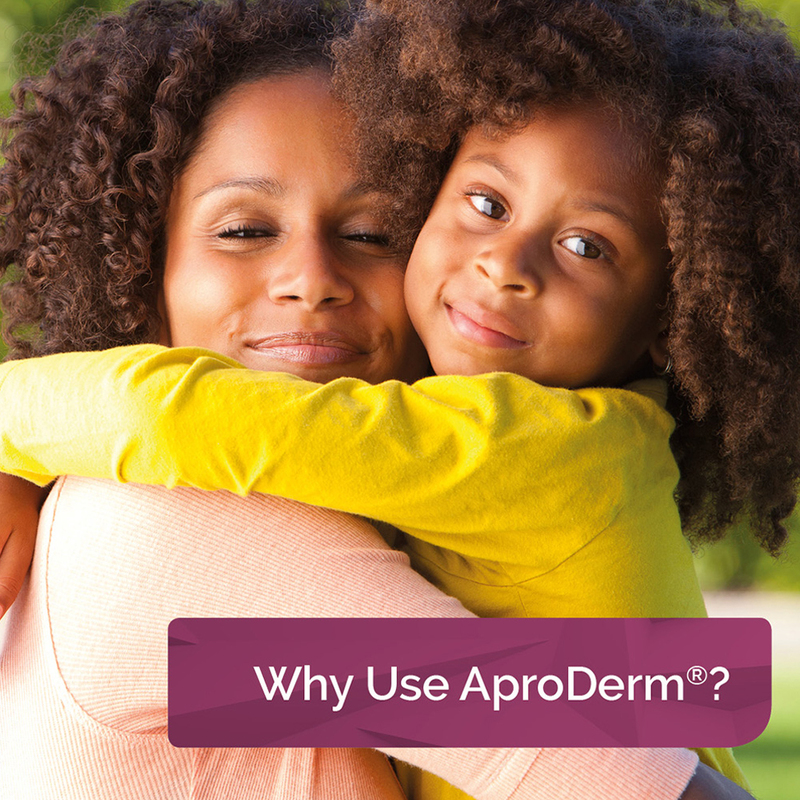 In order to achieve maximum benefit from AproDerm®, patients should apply it regularly, liberally and at least three times a day in gentle, downward strokes following the direction of hair growth. Once their condition has improved they should continue applying AproDerm® in order to reduce the risk of flare-ups. Suitable from birth and formulated with white soft paraffin 15% and liquid paraffin 6%, AproDerm® Emollient Cream soothes, moisturises and protects skin suffering from eczema, psoriasis and other dry skin conditions, as well as being an effective soap substitute. An occlusive, leave-on emollient gel with humectant properties which is suitable from birth for those with eczema, psoriasis and other dry skin conditions. Formulated with liquid paraffin (15%) and isopropyl myristate (15%), a highly moisturising gel without the greasiness of an ointment. Suitable from birth and formulated with dimethicone and trimethylsiloxysilicate (4%) AproDerm® Barrier Cream protects against irritation from bodily fluids associated with incontinence and nappy rash. Designed to maximise skin coverage and protection so only a small amount is required.